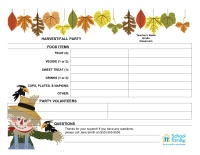 Use these sign-up sheets as an option for securing donations and volunteers for classroom parties. Simply tape the form to your child's classroom door or make it available at events where parents are gathered. Parties/themes include Halloween, harvest/fall, winter holidays, Valentine's Day, and end of the year. 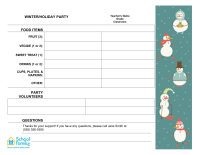 Use this sign-up sheet as an option for securing donations and volunteers for a winter/holiday classroom party. Simply tape the form to your child's classroom door or make it available at events where parents are gathered. 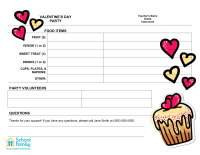 Use this sign-up sheet as an option for securing donations and volunteers for a Valentine's Day classroom party. Simply tape the form to your child's classroom door or make it available at events where parents are gathered. 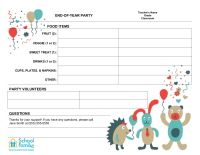 Use this sign-up sheet as an option for securing donations and volunteers for an end-of-year classroom party. 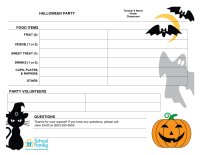 Simply tape the form to your child's classroom door or make it available at events where parents are gathered.